The most irreverent and bawdy Christmas musical ever produced returns to Space 55 for the holidays. Retirees Blanche, Bertha and Mabel sing, dance and drink themselves silly as they fight to keep from losing their Sun City condo to a heartless homeowner’s association on Christmas Eve. Featuring all the charm of A Christmas Carol with a lot more cussing, A Bloody Mary Christmas debuted last year to sold-out audiences and standing ovations. Leave it to Space 55 to deliver an original holiday musical for people who don’t like the holidays or musicals. 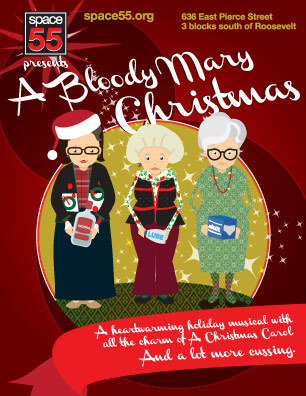 Denny Guge co-authored A Bloody Mary Christmas with Jacque Arend, Shawna Franks and Stacey Reed. He has also written El Piledriver De Amor (for Space 55’s third annual 10-Minute Play Showcase) and an ongoing series of tasteless sketches for the 7 Minutes in Heaven variety shows. He apologizes in advance for his work.